1.The stitch is worked with glass beads in the first sample. Large size pink pearl beads are used in the second sample. Glass bead and pearl beads are alternated in the third sample. 2.The first row is whipped on both sides with medium violet thread. The second row is worked with two and three beads alternatively. 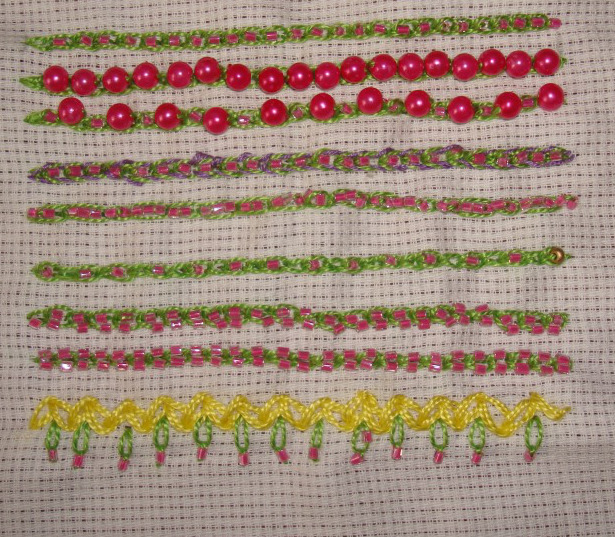 The alternate stitches are worked with beads in the third row. 3.The first chain stitches are worked around the beads in the first row. Two beads are worked into the chains in the second row. Isolated beaded linked chains are worked in between zigzag chain stitch line in the last row.